A ship is a spaceborne vessel controlled by an empire. They are the primary way of interacting with objects and entities in the galaxy via specific ship orders. Ships are classified into civilian and military vessels, the former being controlled individually while the latter form fleets. All ships must be constructed and repaired at Starbases where there is a Shipyard module. Each Shipyard module can construct one ship at a time. Civilian ships represent all unarmed vessels of an empire and are controlled individually. They are equipped with shields, armor and core components automatically once the next tier component tech is unlocked at a free cost and do not have to return to a Starbase to receive component upgrades. Each civilian ship except transports have a monthly maintenance cost of 0.75 Energy. Civilian ships have the evasive fleet stance by default meaning that they will attempt to escape the system whenever a hostile fleet enters it. 75 per hyperlane from closest owned system 1 Energy The Starbase is a space station used to claim star systems and expand your borders. It can only be built in orbit around a star. The full cost is dependent on which star system is being claimed. Mining Station 100 Minerals 1 Energy Mining Stations are used to collect Minerals, Energy Credits and Strategic Resources from uninhabited planets, stars and asteroids. Mining Stations that collect Energy do not cost any upkeep. Research Station 100 Minerals 1 Energy Research Stations are used to collect Physics, Society and Engineering research data from uninhabited planets, stars and asteroids. Observation Post 100 Minerals 1 Energy Observation Posts can be built in orbit around planets inhabited by primitive civilizations to study their society. depends on Megastructure 5 Energy Megastructures are truly massive construction projects only possible in the zero-g environment of space. Science Ships are the primary method of exploring the galaxy and the stars and systems within it. They require a scientist to operate. Once crewed, the Science ship can conduct a survey of individual objects within a system. During these surveys, it can discover resources present on a celestial body (i.e. : planets, stars, asteroids, etc.). A survey may also result in the discovery of an anomaly. Furthermore, an object needs to be surveyed only once and any future hidden resources (such as strategic resources) will be automatically revealed once the requisite technology is researched. The Science ship can also survey debris left after a space battle which may yield research points or possibly even unlock unique technology options. Science ships can also assist the research of a planet. Upon activation, the science ship will orbit the planet and boost its research output depending on the skill level of the scientist on board. The large colony ships allow an empire to settle habitable planets. When ordering the construction of a colony ship, the player is given the option of choosing the species of the pop that is to be sent to the new colony, inheriting all of its traits and ethics. Pops are not consumed nor transported in this process. Once finished, the colony ship may be sent to any habitable world within range to start a colony. Colony ships take one year to build and their upkeep cost is maintained throughout the whole colonization process. Alternatively, colony ships can also be built through the interface of the planet to be colonized. There are four types of colony ships available depending on government. Transports ships are where assault armies are kept. After an army has been recruited it is automatically embarked in a transport ship which will be orbiting the planet where they were created. Therefore, they cannot be built manually. While armies have an upkeep cost, transport ships cost no additional energy to maintain. After a battle transport ships will heal the embarked armies. During war transport ships must be carefully escorted by a military fleet since they are unarmed. Their only purpose is to carry assault armies into enemy planets so that they can occupy them. Additionally, some situation log projects require a transport ship to be completed. Military ships represent all armed vessels of an empire and unlike civilian ships they can be grouped together into fleets and led by an Admiral. Military ships require both Energy and Alloys as monthly maintenance. They are designed via the ship designer. Military ships are classified by their hull size, which influences their combat stats, cost, available sections and components and Command Point cost. Each ship takes twice as much time to be built compared to the previous one in the category. There are five available hull sizes, with the Titan and Colossus only available to owners of the Apocalypse DLC. Each ship size has two technologies that increase its hull points and one technology that increases its evasion. Military ships must be upgraded manually when an upgraded design is created. The cost for upgrading each ship is simply the difference in construction cost between the new design and the old one. Each ship upgrades individually, with multiple ships being upgraded simultaneously if the starbase contains multiple shipyards. When upgrading a ship, the system will attempt to use the most recent version of the same class name. If no design of the same class name is available, then the upgrade process will retrofit them to the most-recently saved design of the same size instead. Maximum Naval Capacity may never exceed 9999. This is not a hard cap on the number of ships an empire can support; it is fully possible to exceed this limit as long as an empire can afford the increased maintenance fees for all of its ships. In fact, the AI will frequently build over its naval capacity if it has the resources to maintain their fleets. Because of this, it may likewise be necessary to build over your naval capacity, especially when you're preparing to go to war against an AI with equivalent or better fleet power (though, in this case, players should also look into increasing their naval capacity whenever possible, if only to reduce maintenance costs). As ships partake in battle they will increase their rank. Ships, when built, start off with zero experience. Ships built in starbases with a fleet academy apart from the required shipyard are granted 100 experience points and therefore start as experienced. Ships get +1 experience point every day they are in combat. Available only with the Apocalypse DLC enabled. The colossus is a unique military ship that requires the Colossus Project ascension perk and has a single slot which can be equipped with a weapon of mass destruction. It has no weapons to defend itself although its Hull points are significantly higher compared to average ships (three times greater than those of titan) and can be equipped with defense components. During space battles the Colossus will follow direct orders, such as going through the battlefield to fire upon an enemy planet. Only one colossus can be constructed at a time and it cannot be merged into fleets. 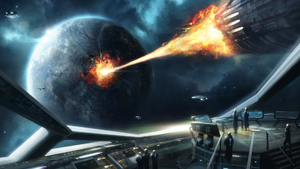 Weapons of mass destruction can only be used during a Total War and as such cannot be fired during wars started from Federation members or Defensive Pacts. Using a weapon of mass destruction causes large amounts of War Exhaustion on the targeted empire, and gives it +50% Ethics Attraction towards Militarist and Xenophobe. This page was last edited on 9 April 2019, at 13:05.